On many times (actually, most of the time) I use Fibonacci with pivot points. This helps me to decide if there is a potential to move to the 161.8% or not. Lets look at some examples and it will be clear to you. After AB move there was a correction to the 78% retracement line. Price moved higher from here and we’ve got signal from CCI to enter. 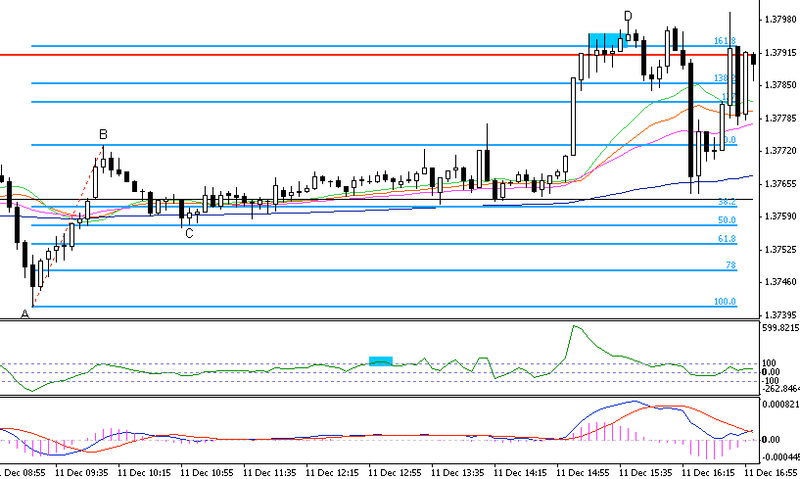 OK, we are long, set stop loss below 78% retracement, what about our take profit target? It looks that 127% extension line is almost exactly where pivot line. Price is below Pivot line so it may act as resistance. 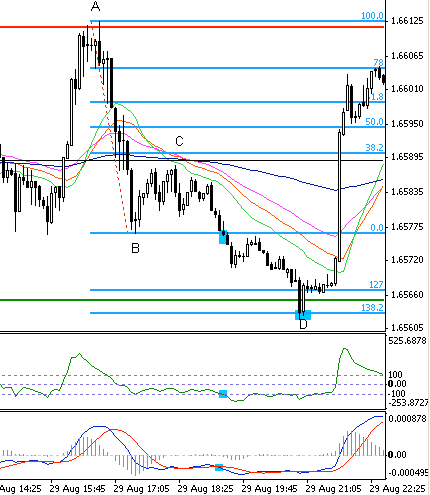 I decided that chances for eur/usd to go up to 168.2% extension line are small. 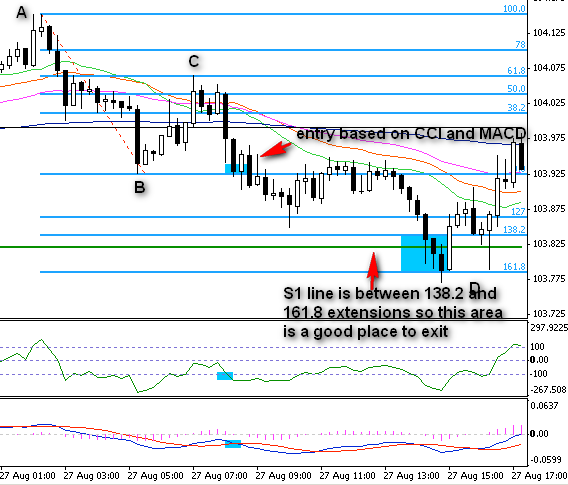 As you can see the blue rectangle, price stopped at pivot and 127% but eventually moved to 138.2% extension line. This move was to weak to go higher above pivot line. 5.2. 127% extension just above R1 line. Another eur/usd 5 min example. Black line is pivot, red line is R1 resistance. 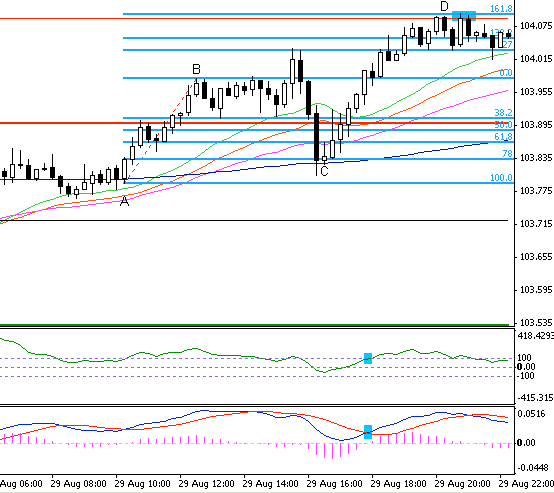 We had a nice AB move and correction to pivot and 61.8% retracement line. Later we got signal from CCI and went long. What about our target? 127% extension line is right behind R1 resistance. It may be a strong resistance area, so it is a good idea to close trade at a place like this. 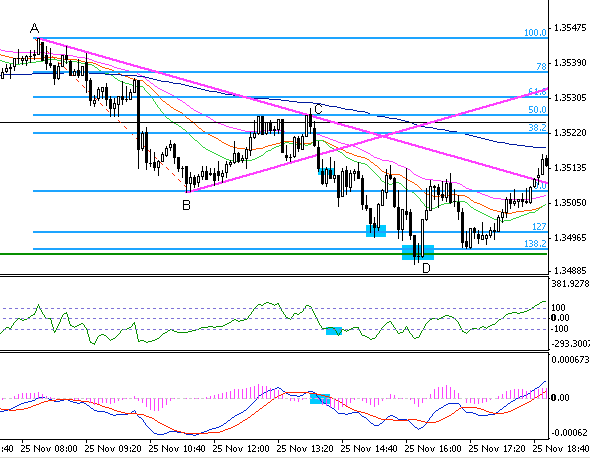 On this chart move AB ended aroud R1 line and price moved sideways. Finally bulls attacked resistance and price moved up above recent high. Is there a chance to get to the 161.8% extension line? Along way we have 127% extension line at almost the same place as R2 line. This makes this area a strong resistance. 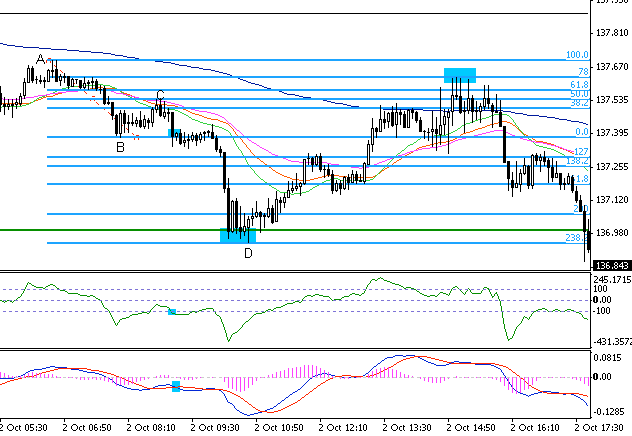 Price managed to get to the 138.2% extension, but failed to move higher. From 15 minute chart we knew that uptrend is in place. We saw an ABC move with a deep correction to the 78% retracement line. After that we had a range move and eur/usd managed to hold above pivot line (black line). Finally, we got signals from MACD and CCI. What was the best target for position? 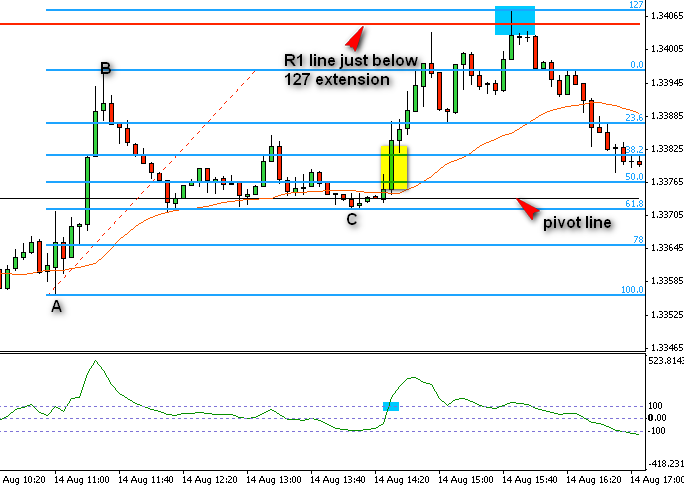 We were already above pivot line and 161.8% extension was very near R1 line. It was the best take profit target and as you can see it worked great. Stop loss would be placed below C.
We confirmed a dowtrend. This ABC move was easier to spot on 15 min. chart (sometimes when I am not sure where are best AB points, I go to the higher time frame – less noise and better picture of current situation). Correction ended at 50% retracement, around pivot line. We could use some trendlines, but signal occured later. Stop loss would go above 200 average. Where to set take profit target? 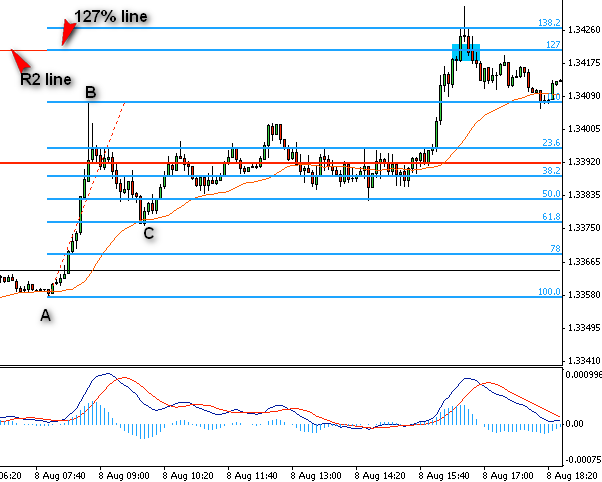 We can see that 138.2% extension is very near to the S1 line so this was the best TP target. 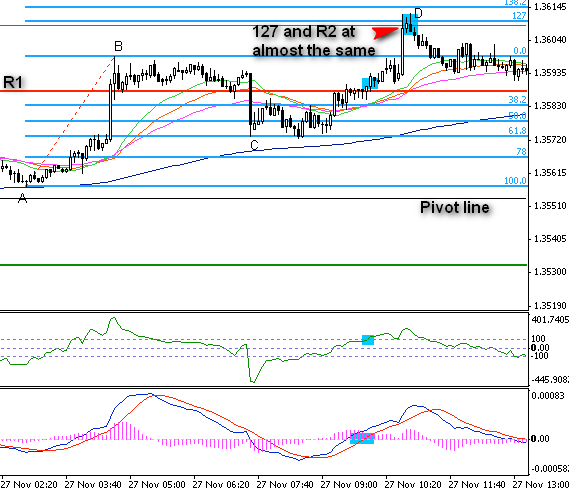 There was some stop and bounce from 127% extension but in the end EURUSD moved down to the 138.2% and S1 line. This is an important example, because point A is below R1 line and point B is above that line. Lets look at current situation. eur/usd is above pivot line (black) and above 200 moving average. We are looking for opportunity to go long. There was an ABC move with correction to the 61.8% retracement line. After that, we got signals from MACD and CCI, but this was not the place to go long. Pirce was still below R1 line which might be a resistance. The best option here was to wait for close above R1 line. When that happend (blue rectangle) we went long. 127% extension was very near R2 line so this was the safest exit point for us. 138.2% extension was too far from R2 which as you already know, is strong resistance. Uptrend in place, when we went long after signals from CCI and MACD. EURUSD was above pivot. 161.8% was right at R1 line so this was a great take profit target. You could try to close some position at 138.2% extension, but when it looks so nice it is good to take a little risk and go for target at 161.8%. This one is also important. We have here an uptrend ad we saw an ABC move. Great, but 0% line (B point) is right at R1 line. We had signals from MACD and CCI to go long, but this was below R1 line which might be a resistance. In cases like this, the best option is to wait until close above R1 line and enter there. We take away some profit because of late entry, but it was safer for us. Move ended at 161.8% extension. Trend here is not that clear but from higher time frames we knew it was rather bullish. After ABC move there was a long and boring range move. We had signal to go long and little bit later price exploded higher. 161.8% extension was just above R1 line so this area was a good place to take profit and close position. Oil is above pivot line. It is also above 200 expotential moving average (which later serves as support at point C). We have positive averages (21 above 33, 33 above 55) so this is all good for bulls. After signal to go long move ended at 161.8% extension, near R2 line. Wha is interesting about this case is AB move. You can see that first we had correction to the 38.2% retracement, and later there was a move to the 127% extension (if you went here long, you probably would be stopped out around recent low so 103.90). 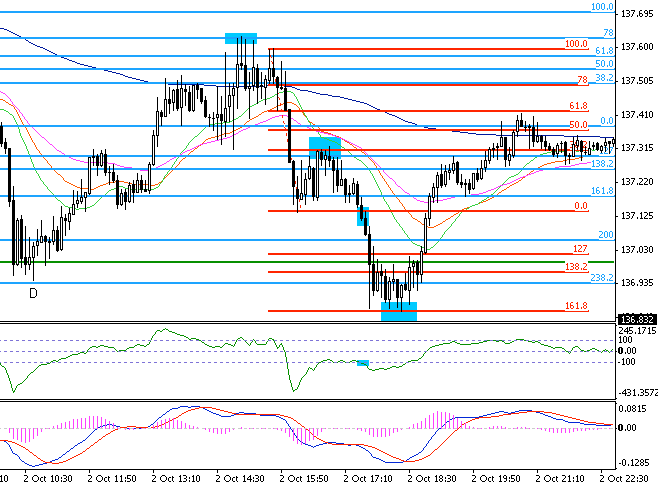 Later price went down to the 78% retracement and 200 average. Notice, we did not change A-B points. That is because that move was not over. Later we saw a move up to the 161.8% extension. Before that ABCD move, we had some movement up. Later pivot line failed as support. Next – correction to 61.8% retracement and move down with signals from CCI and MACD. Stop loss would be placed above 78% retracement. Look at extension lines. 127% extension worked, but it was temporary and we saw that 138.2% and 161.8% were near to the S1 line. So which one was best? Hard to tell. I went with 138.2%, but you can see that price went down to the 161.8% extension. Still, it was a good call not to close at 127% extension. Sometimes situation is not that clear as you can see and you have to choose. 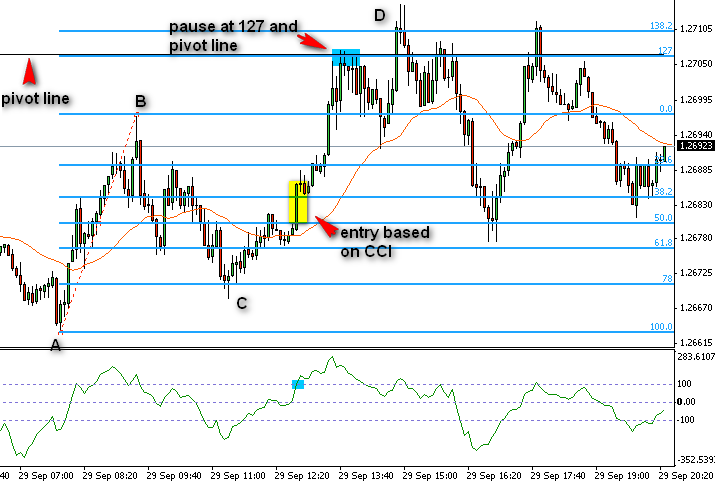 EURJPY was under 200 moving average and under pivot line. It looked like there is a potential to move down to the S1. We saw an ABC move and entered after signals from MACD and CCI. But check where S1 is. It is near 238.2% extension… little far. It was worth the shot, but I closed half of the position at the 161.8% extension, for safety to book profit. Of course on the rest stop loss was moved lower and take profit set to the 238.2% extension. This is rather rare case, but as you cas see even in that conditions it all works great when you have Fibo in place. 5.13. Continuation of move from 5.12. We just needed to spot another ABC move. Notice that point A is not at the old top (78% retracement) but little lower. That is because this is the place where move down started. the rest should look familiar. Retracement to 38.2% (C) and signal from CCI and break below 0 line. 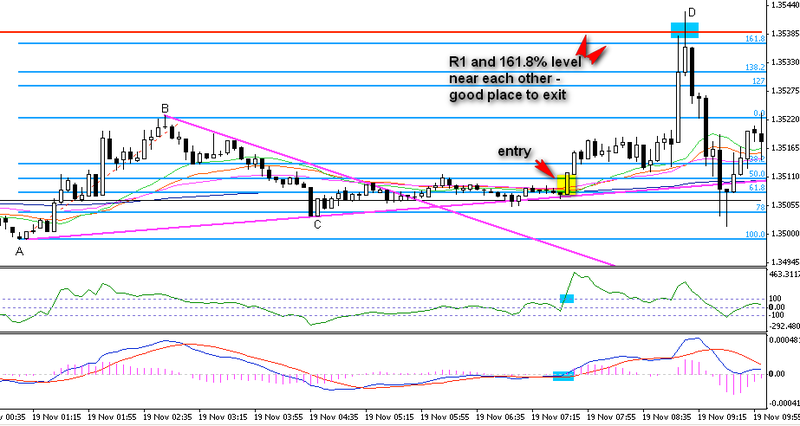 In this trade, I would go for exit at 138.2% extension, but you can see that it ended at 161.8% extension. This is a tricky example of move hard to catch. We had a strong move to the R1 and then price reversed. We got some correction move but it did not touch the retracement line. Sometimes it happens. Later we saw that 138.2% extension worked just fine. In this case, after signal to go short, stop loss would be placed above pivot line and 38.2% retracement line.